As a brisk wind blew in through the entrance of Science City at Union Station Kansas City, the promenade doors kept opening and closing. The sensation of cold Missouri air rushing in was a steady reminder that lots had to get done that morning. Boxes were being hauled in at breakneck speeds as Time Warner Cable volunteers and Science City staff joined to together to unload the multiple trucks which arrived for the day’s activities. The date: September 20, 2014 and this was the beginning of the first-ever Time Warner Cable Girls STEM Expo at Science City. The concept for TWC Girls STEM Expo was simple – find a way to showcase all of the wonderful STEM learning opportunities in Kansas City in a fun and interactive way for kids. Time Warner Cable, through its Connect A Million Minds (CAMM) initiative, had built strategic partnerships with multiple local STEM non-profits all of whom would play a part in the event. The nonprofit exhibitors, who were showcasing their programs for children, were CAMM grant recipients. 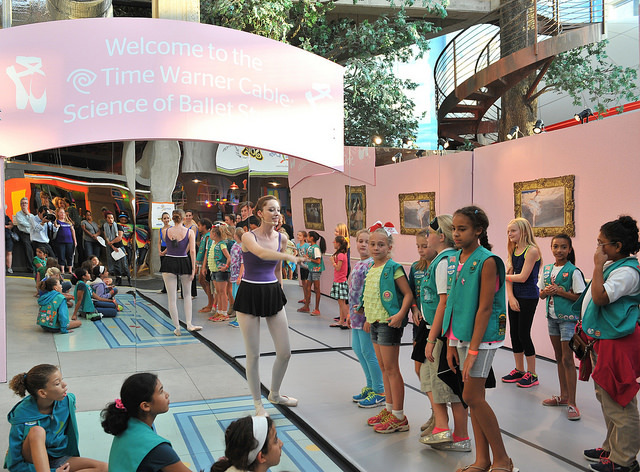 And, while admission to the museum was free to the public courtesy of Time Warner Cable, the Girl Scouts of Missouri – another CAMM partner – had received a special invite to come and see what we had planned, privately. My job at Time Warner Cable is to help bring our Connect A Million Minds program to life. We look for creative ways to engage both the general public and our employees, so they can experience hands-on STEM in a way that is both memorable and instructive. Our goal, always, is to deliver that lightbulb moment when a child realizes “this is why I study math/science”. Our hope is that realization translates into greater interest in STEM, and hopefully leads to a career in the STEM fields. Along with my Events colleagues, we produce at least 6 events every month, across our footprint. We partner with nonprofit organizations at events like TWS Girls STEM Expo. We aim to go far beyond just being a cash donor. The Events team works closely with the partner to develop experiential displays that will excite kids and parents. 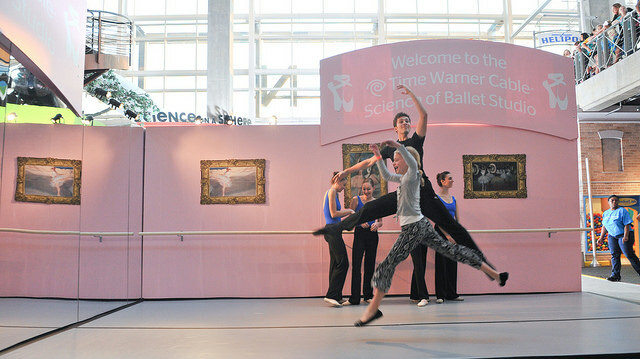 For example, at TWC Girls STEM Expo, I created Kansas City’s first “Science of Ballet Studio”. Modeled after traditional ballet studios, our space was designed to visually appeal to the girls and then teach them the STEM of dance. 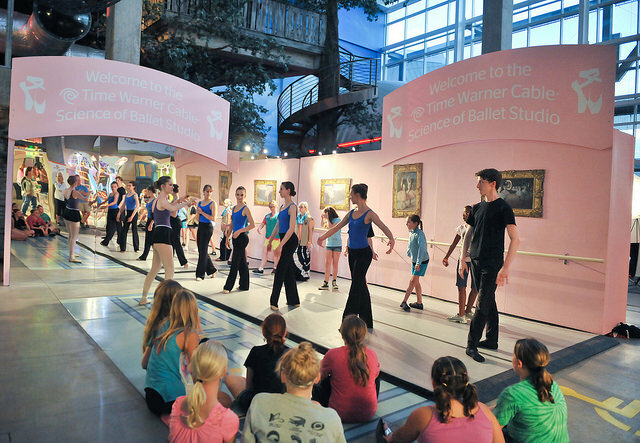 We partnered with the local Kansas City ballet and an upcoming actress/ STEM advocate, Emma Dumont, to perform and practice their art while highlighting the physics, techniques, and scholarship behind ballet. As dancers from the KC Ballet performed the tour jete, plie, pas de bourree, etc, Emma spoke to the audience and explained how science and ballet work hand-in hand. As the dancers leaped across the marley floor, the little girls seated just a few feet away stared in silent wonder. As a final touch, we invited our audience to come into the studio space and try some of the moves for themselves. Ultimately, my goal – to make STEM accessible in a beautifully relevant way – was met. The girls got to see that science is all around, not just in the classroom, but in something they already love like ballet. Seeing the faces of the kids makes CAMM real for our employees, including me. Kids are clever and we need to constantly innovate to find ways to engage with them. But when we deliver, we are putting life into our mission: to develop the next generation of problem solvers.